Well established as one of the “jewels” of the repertoire, George Balanchine’s Jewels is a tantalizing reflection on the sheer beauty of ballet. 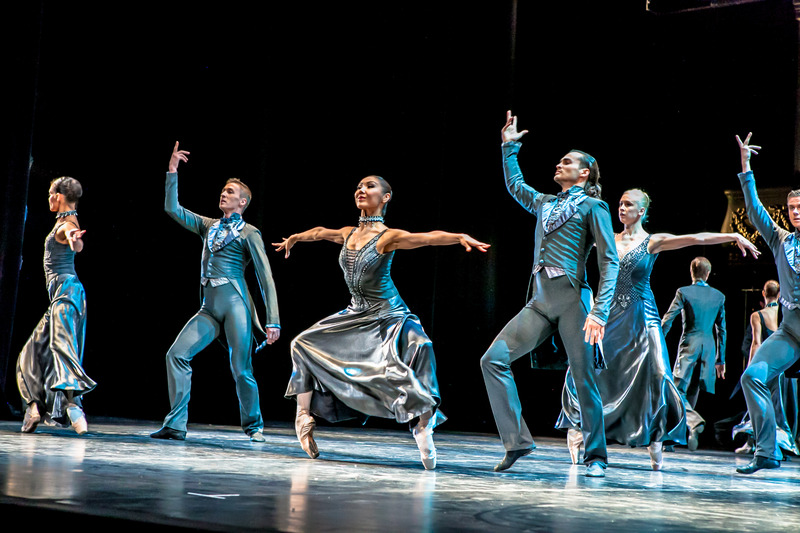 In Emeralds, Balanchine takes inspiration from the fluid serenity of Fauré’s music to create a series of pas de deux and trois, complemented by work of gentle grace from the female corps de ballet. While the piece features constant motion, there is an overall air of languid tranquility. 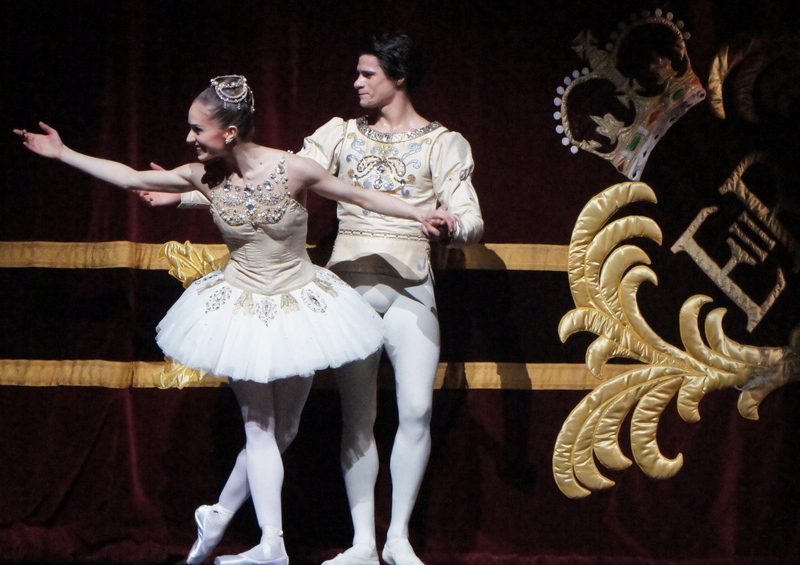 Roberta Marquez and Edward Watson grounded the company with their elegant grace and strength. The vivid emerald green of the ballerina’s bodices is stands out against various other shades of green. Costumes are also adorned with glittering emeralds, sitting in a way that looks like jewelry. The stage setting is framed by green-lit gossamer curtains, which have cascading emeralds sewn at the bottom. On a rear full-sized screen, a projected curtain is progressively pulled back as Emeralds progresses, perhaps suggesting the dawning light of a new day. The rise of curtain for Rubies drew an appreciative gasp from the audience, amazed at the glamorous sight of the ruby-encrusted costumes, grand silver columns and large Art Deco chandelier. The music of Stravinsky chosen for the score centres on playful piano playing, delicately performed here by Robert Clark. Adopting a frisky, fanciful tone, Balanchine has the dancers appear to be almost at play rather than performing serious steps. A light jogging step is used to great effect to portray this carefree style. 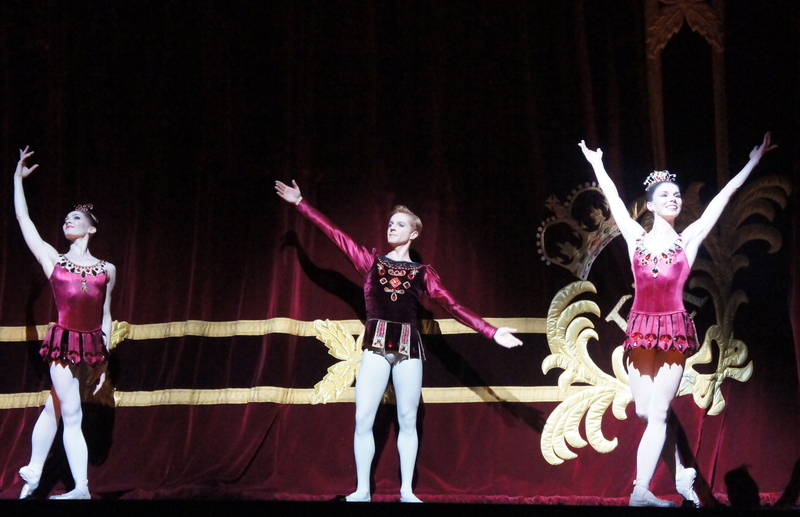 The highlight of this act, and perhaps of the whole performance, is the stunning combination of Natalie Osipova and Steven McRae. To see two dancers at the height of their powers take such pleasure from the dance and from each other is a delight indeed. The precision and speed of the pair is breathtaking, with their genuine smiles adding a polish beyond the technical supremacy of their work. Melissa Hamilton provided further pleasure in featured solos. Design for Diamonds lacked the vivid colour of the first two acts, but the spectacle increased as the size of the ensemble grew and grew towards the finale. 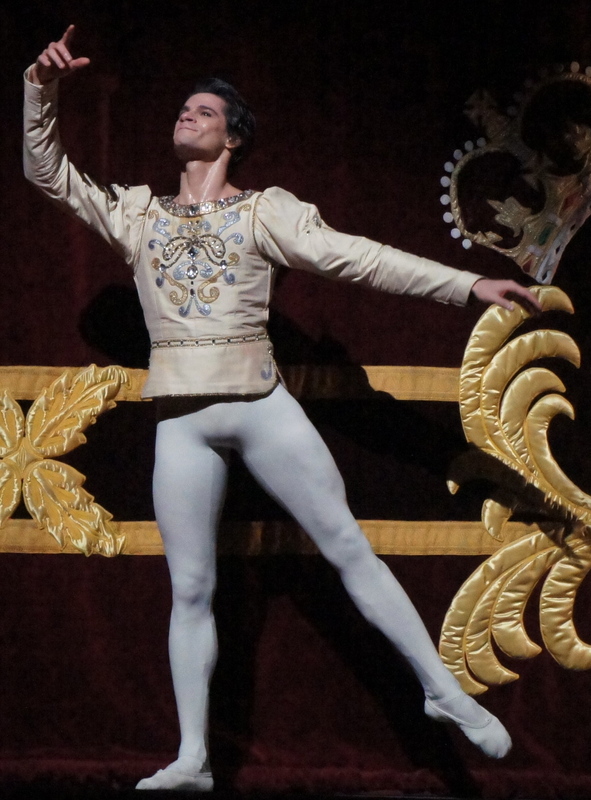 Marianela Nunez and Thiago Soares enhanced the romantic undertones of the piece, especially in their first pas de deux, which was treated as grandly as that of a big story ballet. Similarly, the finale had the feel of a grand climax, most likely due to the impact of music by Tchaikovsky, that most balletic of composers. 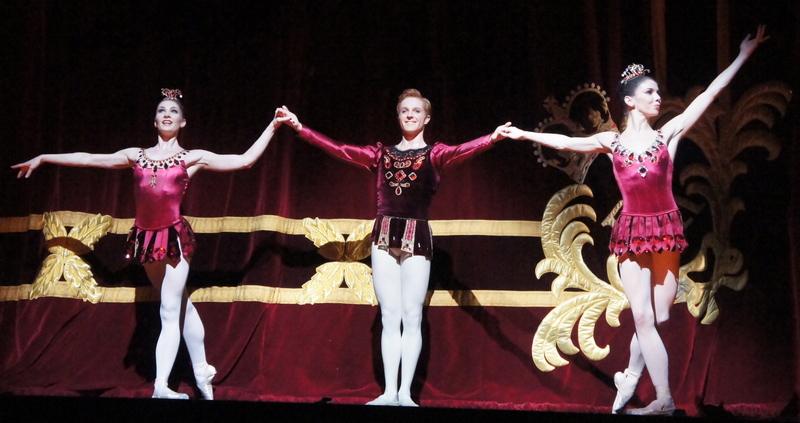 Hopefully Jewels will be seen as part of the repertoire of The Australian Ballet at some point in the near future. 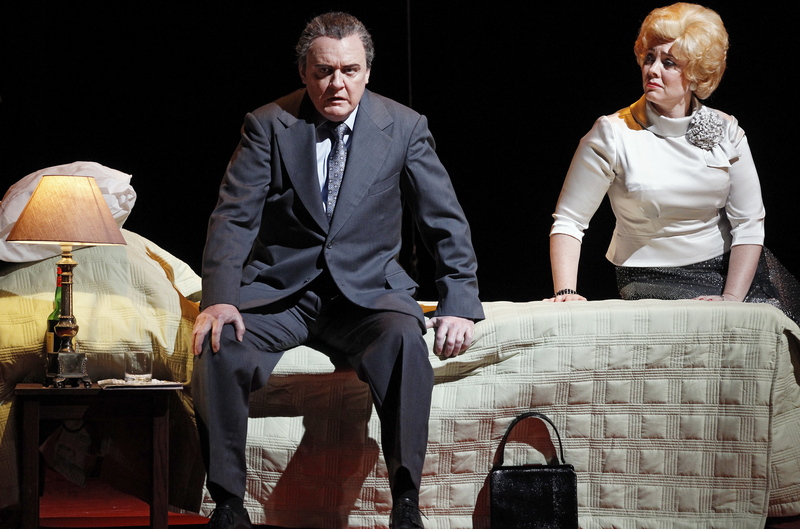 Jewels was reviewed at Royal Opera House, Covent Garden at 2pm on Monday 30 December 2013. 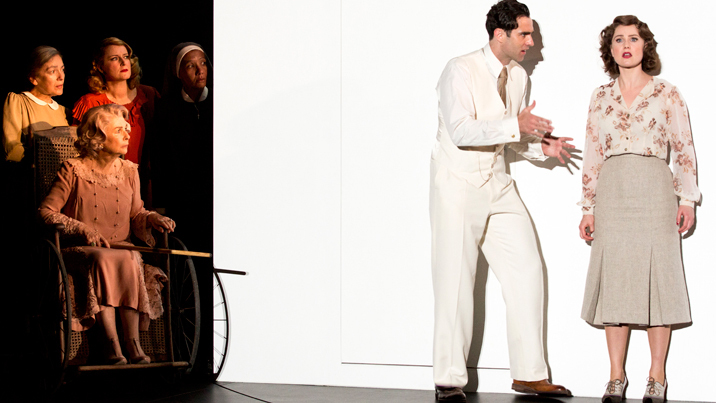 One performance remains in this season on 7 January 2014. 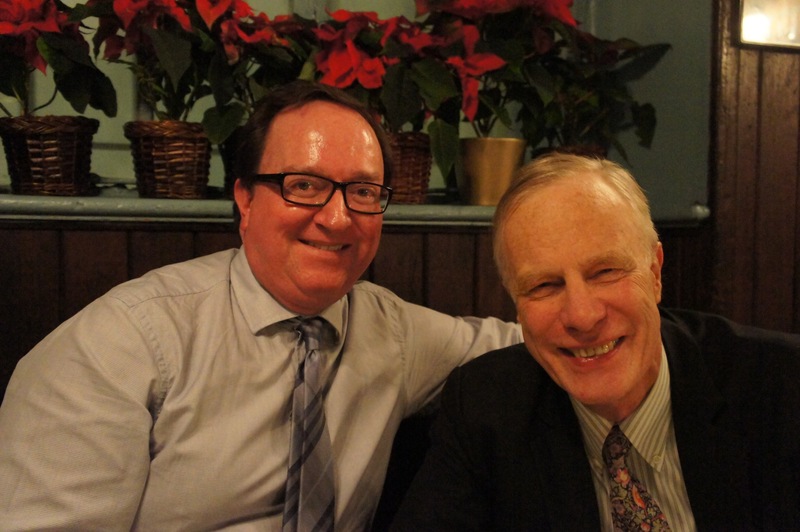 Footnote: after this performance, Man in Chair was fortunate enough to have the opportunity to meet and have dinner with fellow classical reviewer Mark Ronan (below, right). A prolific attender of the arts, Mark writes excellent reviews of works in London and across Europe at his site Mark Ronan. In a further connection, Mark and myself are both involved in Mathematics education by day.